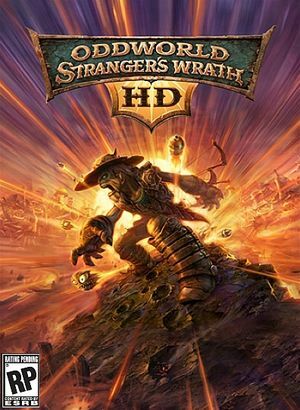 Updated version of Oddworld: Stranger's Wrath. Includes more detailed character models, higher resolution textures and other visual improvements. No in-game ability to change video, input, and language options (uses an external launcher). Includes the original non-HD version as a downloadable extra. Rename <path-to-game>\Launcher.exe to something else. Delete or rename copyrights.bik and OWIlogo.bik. FXAA, SSAA (4x, 9x, or 16x). 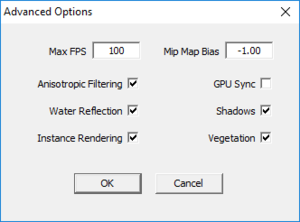 Includes a setting for capping the frame rate, but it doesn't seem to work. When FPS is higher than 100 the player and npc can get stuck. 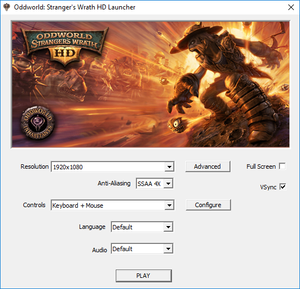 Launcher requires keyboard or mouse input. See here to launch the game without the launcher. Togglable subtitles for pre-rendered and realtime cutscenes, and for vital GameSpeak. Unlike the fully-dubbed Xbox version, the CGI cutscenes are in English with subtitles. ↑ 1.0 1.1 File/folder structure within this directory reflects the path(s) listed for Windows and/or Steam game data (use Wine regedit to access Windows registry paths). Games with Steam Cloud support may store data in ~/.steam/steam/userdata/<user-id>/15750/ in addition to or instead of this directory. The app ID (15750) may differ in some cases. Treat backslashes as forward slashes. See the glossary page for details.